I have just announced my new project using the Ogre engine: Cello Fortress! 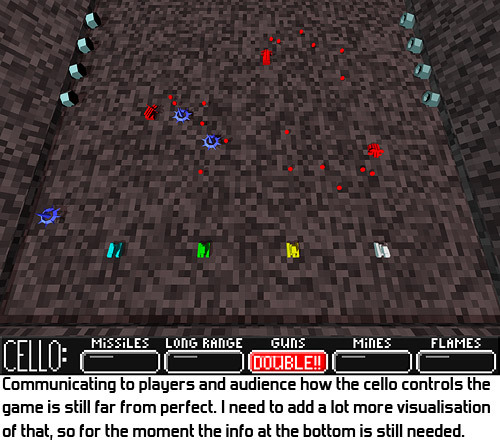 Cello Fortress combines a live cello concert with a twin-stick-shooter, in which the cellist plays against the audience. It brings a quite unique experience in which I control the game by improvising on my cello, simultaneously fending off attacks and making music. The audience takes up controllers and tries to beat the fortress. The result is (hopefully) an exciting interplay between cellist, players and audience. Up to four players use controllers to navigate their tank, using one stick to move and the other to shoot. They dodge bullets and attack the turrets. At the same time, the game analyses the notes played by the cellist, as picked up by a microphone. Aggressive notes activate the burst-cannons, dissonant chords turn on the flame-throwers, and an ominous melody charges a bombardment. Cello Fortress is only playable at live concerts given by... me! So I am not only the creator of the game, but also the cellist. The debut of Cello Fortress will be at the Indigo 2012 exhibition on 28 and 29 September in Utrecht, Netherlands. The version played at Indigo will be a fully playable, early prototype, to experiment with this weird concept. So to play Cello Fortress, visit Indigo! I know, it is in the Netherlands, so few will actually be able to go there, but still, if you happen to live near Utrecht, come and check out Indigo! For more info, check out this blogpost. Last edited by Oogst on Tue Mar 01, 2016 11:16 pm, edited 8 times in total. I have added the actual description of the game and images and such! I don't get the idea of the game yet. Do you really have to own a cello to play the game ? EDIT : the blog post better explain the game itself ! The game can only be played at events/concerts. The idea is that I play the cello, and the audience plays against me. So the idea is not that the players play cello themselves, and you can't play at home. That's an insane idea and I like it very much. Thumbs up! Oh and a question, as you're just using a microphone could any stringed instrument be used or just a cello? Would it even need to be a stringed instrument? What about a clarinet or a DJ setup with scratching stuff etc? Cool! I hadn't seen the actual article yet, nice that they feature my game! areay wrote: Oh and a question, as you're just using a microphone could any stringed instrument be used or just a cello? Would it even need to be a stringed instrument? What about a clarinet or a DJ setup with scratching stuff etc? Other string instruments could definitely be used, but to improve the quality of my note-detection-code and reduce errors, I currently ignore any notes outside the range of my cello. If I change that range, another string instrument could also play. Even a guitar, although I don't know how good my algorithm is for non-bowed instruments. As for really other instruments: I don't know how the sound-spectrum of, say, a clarinet looks. My current algorithm uses certain properties of the spectrum of a cello and won't work if the spectrum is fundamentally different. For example, I know that the spectrum of an organ is quite different and would probably not work well with my code. I have no idea how this is for other non-string-instruments. Also, my controls are very much based on cello and on the things I do when improvising, and those things are not even possible on some instruments. For example, the flamethrower attack requires playing chords, which is not possible on a clarinet, let alone on a scratching DJ setup. But what in case I do not play the cello? The game is unplayable without being musician or there is some playability??? Slappy wrote: But what in case I do not play the cello? The game is unplayable without being musician or there is some playability??? The audience/visitors don't play the cello, they play using Xbox controllers against the cellist. I am the cellist myself, and I am like a performer here, so the cellist is not from the audience. That is why Cello Fortress will only be playable at events. Can't wait to see a vid of this. I have finally made a proper trailer of Cello Fortress! It is a really weird concept, so I hope this gives some idea of what it is all about! Cello Fortress is, of course, being made in Ogre. It currently only has early prototype graphics, but with better models, depth of field blur and proper lighting, I imagine it is going to look quite nice. 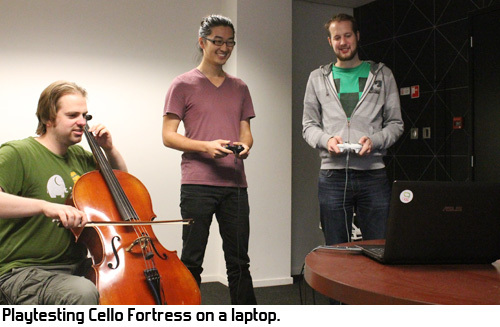 I also wrote a blogpost with some more info here: Cello Fortress trailer revealed! But while you're at it, why not implement guitars and other instruments as well? I could see this working for any instrument that can output a larger variety of speed and notes. Increase the number of potential performers. Really impressive. I like how you manage to take gaming to a different point of view. TheSHEEEP is right, it could be really fun with more instruments. Geep up your good work ! I second this! I hate Metallica!!! And in other news... YOU'RE ON ROCK PAPER SHOTGUN! Wow, I hadn't seen that one yet! Always a delight to read Rock Paper Shotgun: the commenters produce even better puns than the writers themselves! Really awesome that they picked up on it! New blogpost about Cello Fortress! 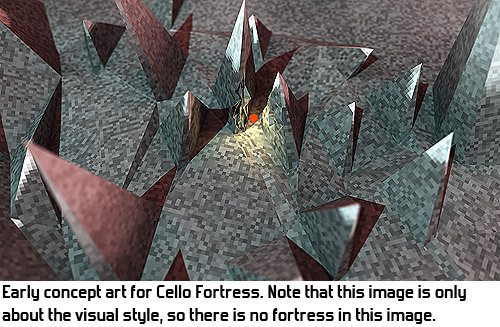 About the game design choices and process behind designing Cello Fortress. With a great quote on innovation near the end that still has a big influence on me! Woohoo! Interview about Cello Fortress at The Penny Arcade Report. Interesting read, and an honour to be interviewed there!